The badge man shoots. 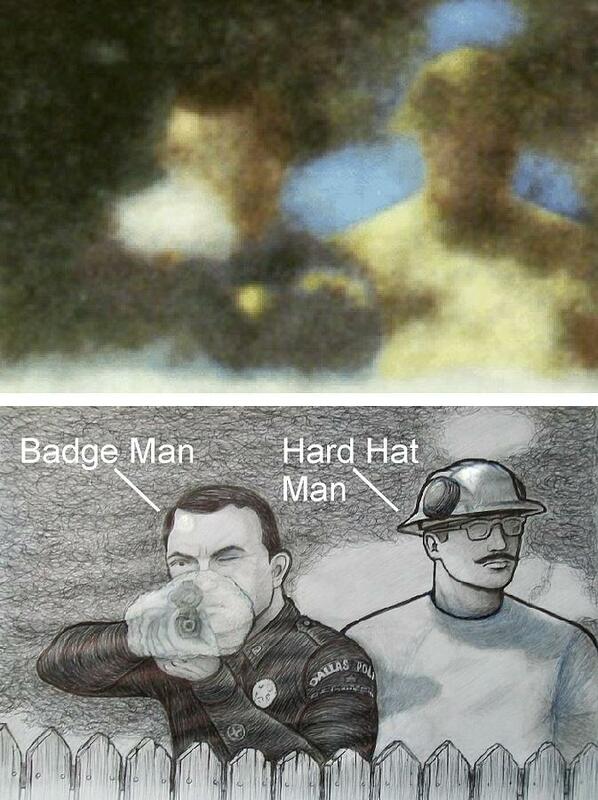 The Badge Man gives his gun immediately to the Hard Hat Man aka Railway Man after heâ€™d fired the one single shot. The Railway Man immediately turns and walks away with the rifle which can be taken apart and fitted in his toolbox. Now the Badge Man/ Police Man desperately had to take possession of Arnolds film not blow his cover as he tought. So the Badge Man/Police Man aproaches Gordon Arnold, who junped to the ground as a real soldier (according to witness on the other side of the road), because he had just fired a shot past Gordon Arnolds left ear, "But he didn't wear a hat and he had dirty hands but that didn't realy matter much at that time because, with him crying like he was, and with him shaking when he had the weapon in his hand, I think I'd gave him almost anything except the camera cause that was my mothers", says Gordon Arnold. "And litteraly what the man did was kick, kick me, and ask me if I was taking a picture", Gordon Arnold says. "I told him that I was, and when I looked at the weapon*** it was about that big around (Gordon Arnold shows the size of a hand gun between his hands) I decided let them go ahead and and have the film. I gave it to him and than he went back off in this direction (Gordon Arnold points with his left arm half way behind him). I went off in this direction." (Gordon Arnold points left with his left arm). 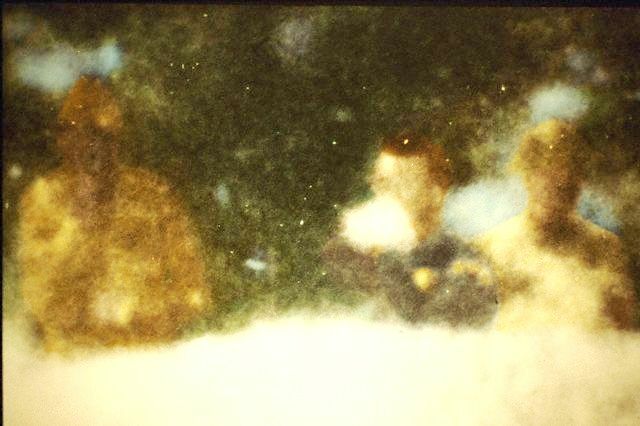 The same scenario goes for the second shooter besides the badge man behind the grassy knoll further down the fence wearing a blue hat and a black jacket according to witness Ed Hoffman. "He had a gun and he walked towards the railroad. He tossed the gun to a second man than he turned and straightened his jacket adjusted his hat and walked casually away", says Ed Hoffman. "The man with the striped railroad shirt walked over to the electrical box with the gun. He took the gun apart. He put it in a toolbox. He then walks slowly away in the direction of the railroad track." This is what went down that day with shooter number 3 and 4. 4-men of which 2-of them behind the grassy knoll picket fence because they have been 100% identified and seen by the two eye witnesses. A classic cross fire ambush one could say in which shot number 1 and 2 came from an other direction and thus not from the grassy knoll. I think the idea was that each men was to fire one single shot since there was no time for reloading because they needed these precious split seconds to get away. Sure enough is that the Hard Hat Man aka Railway Man moved along behind the Picket Fence. I think there where two Railway Man. One standing beside the Badge Man with Hard Hat on in what seems to be a white T-Shirt. The other Railway Man with with the "Striped Rail Road Shirt" standing beside Shooter Number 4 "The Man with the Blue Hat and a Black Jacket". Both man used a toolbox to hide the gun after taking it apart immediately after both the Badge Man and the man with the Blue Hat and a Black Jacket each fired a single shot with 0.7 sec between them. "The man with the Striped Rail Road Shirt walked over to the electrical box with the gun. He took the gun apart. He put it in a toolbox. He then walks slowly away in the direction of the rail road track." The Rail Road man with the white T-Shirt walks along the Picket Fence seemingly to the position of Shooter Number 4 the man with the Blue Hat and a Black Jacket. However there is the possibility that they are one and the same. For instance after Badge Man's single shot the Railway man in the white T-Shirt takes his gun takes it apart and put it in his toolbox. He then puts on a Striped Rail Road Shirt walks along the Picket Fence towards shooter Number 4, the man with the Blue Hat and a Black Jacket, who tosses him his gun. He then walks behind the electrical box takes this gun apart and put it next to the other taken apart Badge Man gun. He then walks slowly away in the direction of the rail road track with two taken apart guns in his toolbox. Still I think it would be more logical, also looking at the very tight escape schedule, that these hit-men obviously followed, to have two rail-road men with two toolboxes next to the two shooters in order to be able taking the guns out of sight immediately after the shooting which was essential to their escape plan. They worked very fast and most people running up to the Grassy Knoll where too late to see anything behind the Picket Fence. Maybe when people looked over the Fence the railway man was just kneeling behind the electrical box to take the number 4 gun apart, because nobody would be able to see him from that angle. Definitely the way Railway man with the Striped Rail Road Shirt "slowly walks away" tells us something about the mindset of these guys. The kept their nerves pretty much together where the Badge Man almost lost it when he had set his mind on getting the film role out of Gordon Arnold mother's film camera. And I don't believe that Gordon Arnold's involuntary 18 month army Alaska trip just three days after was a coincidence. I just had a little epiphany because maybe indeed one Helper/Railway Man besides the two shooters 3 & 4!? Badge Man shoots and the Railway Man with the Hart Hat and White T-shirt on standing next to him has a Striped Rail Road Shirt in his hand. When the badge man gives him the rifle he uses the rail road shirt to cover it up and walks away behind the bushes towards the place he had left his toolbox. He then takes apart the gun behind the bushes and puts in his toolbox. He closes the toolbox and puts on the striped railway shirt. He then walks along the Picket Fence stand still for a moment to see people coming running towards the fence. He hastily walks on to shooter number 4, the man with the Blue Hat and Black Jacket on who tosses him his rifle. He realises that he can't just take the rifle apart behind the picket fence so he decides to hide and kneel behind the electrical box take the gun apart and put it next to the other. He then walks slowly away in the direction of the rail road track with two taken apart guns in his toolbox. Don't forget that for these hit man it was just an other job. The less people involved the better so if they could do the job with one accomplish instead of two it would be better looking from that perceptive. Maybe they thought that one helper/railway man with one toolbox is less suspicious than two railway men with two toolboxes and thus less 'getting caught risk'? And we know at least that these man are very familiar with using disguises and switcheroo techniques like changing clothes and tossing guns to other accomplishes to confuse bystanders and to get rid of evidence as quick as possible. But they kept moving in away not to cause any suspicion as we see the rail road man moving steadily along behind the picket fence and seemingly even standing still for a moment. Also the badge man who spends extra 'getting away' time in confiscating film role. So, while the Railway man not only uses his striped railway shirt to hide a rifle as quick as possible he also changes his appearance a bit. Where one witness sees a man with a white T-shirt an other sees one with a striped railway shirt.